6ty° has been providing civil design services on the Hutton Ridge subdivision since its inception in 2007. 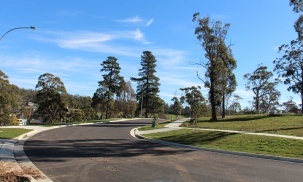 Hutton Ridge is a 7 stage residential development, in excess of 100 lots in Prospect. The two biggest challenges of this development were managing stormwater flows, so as not to overload the downstream system and to reshape an extremely steep site to create lots suitable for building. 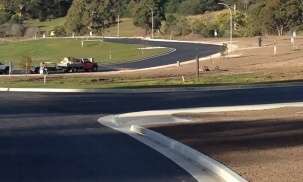 Stormwater discharge was controlled using a detention basin that doubles as a parkland for Public Open Space. This area was designed to flood to a minor level annually and was landscaped accordingly. The remainder of the basin was grassed and landscaped for public use. Beneath all this, a complex series of stormwater pits and pipes manages stormwater flows accordingly. The very steep site required precise surveying and computer modelling to allow earthwork design and creation of the final surface. Tens of thousands of cubic metres of material have been moved during this land development.